Book Review: Tendai Mwanaka's "Keys in the River: Notes from a Modern Chimurenga"
"Most, if not all, of these stories are real life stories that I sometimes inflected towards the fiction genre, but in which I have tried to keep the facts correct, or almost correct, so that someone reading this novel should know they are reading about real life in modern Zimbabwe" (p6). It took me longer than I expected to finally read Keys in the River: Notes from a Modern Chimurenga by Zimbabwean author, Tendai Mwanaka. I'm glad I finally got the chance to read it last night. 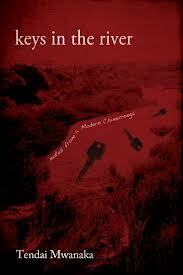 Published by Savant Books, who I have to say a big thank you for sending me the review copy, Keys in the River is a collection of 23 short stories. The stories in this collection show the many different experiences of Zimbabweans. It begins with Sunset a story about love, relationship fears and the lengths a man will go to due to such fears. It ends with Sunrise, where we see the consequences of such decisions. In between there are stories of young men finding love (Mangoyi - The Cat), entrepreneurial spirit in the face of poverty (Mushazhike and Nyadzonya), illegal border crossing (Limpopo's Bones), on ZANUPF supporters (Mbuya Chitungwiza), the consequences of supporting the opposition party, MDC (Breaking the Silence), or false accusations from the government (The List). Stories are set in rural Zimbabwe, others in cities, and some outside of Zimabawe touching on Bostwana, Mozambique and South Africa. In a few situations many chapters after you first meet them, characters return to continue their story. Stories like Sunrise and Sunset, but also Mushazhike and Nyadzonya are such cases. In others, like Limpopo's Bones and The Dark-Haired Girl a few themes overlap. I liked the continuation of stories and the cross-cutting of themes. I also enjoyed the different styles in which the stories were written - some were simple, others poetic. Although sometimes it did feel like there was a moral to a few of the stories. The collection also makes you think. In Breaking the Silence and The List, where people disappear or are abducted and then tortured, how safe can you really be in your own country? Also, how easily can you be wrongfully accused? In Limpopo's Bones the thought of it being illegal is removed from border crossing. Here, we just read about the people who are crossing, and the border gangsters who help them do so. There are certain dangers when crossing but people put themselves through this regularly for the possibility of a better life. Although in Nyadzonya, which also includes illegally crossing to Mozambique from Zimababwe through the feat that is Nyadzonya Mountain, sometimes there's no better life on the other side. Yet, people take that risk on a regular basis. In the introduction Tendai Mwanaka goes into some detail on the meaning of the term 'chimurenga'. I won't go into that here, but the word means struggle. Although there are tales of love and tragedy, politics and poverty, fundamentally Keys in the River is a collection of stories about struggle told from different perspectives.